It matches indoor design with a smart appearance. * It is also possible to use it with 2 units geared. * It is also possible to gear with the opening and closing of the door. 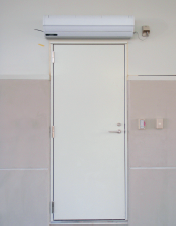 * Large capacity: There is also a separate air curtain for industrial use with a specification of 60 ㎥/ / min.